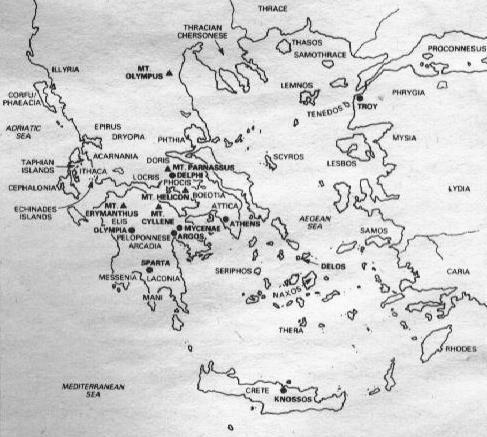 Map and Information of the Ancient Greek Myth World. The mythical kingdom of Agamemnon, it was the center of Mycenaen culture. The city was associated with the goddess Hera, who is often described as Argive Hera, and her shrine, the Heraeum, is located six miles from the city. Argos means "the plain." The city of the goddess Athena and home of the most famous Greek temple, the Parthenon. Athena is associated with the city as she was responbsible for the birth of the first king, Erichthonius. Avoiding the lust of Hephaestus, the latter spilled his seed and fertilized Gaia; Erichthonius, who was half-serpent since being from mother earth, was born. The cultural as well as official capitol of the Greek world, the ancient Athenians believed they were autochthonous, or of the soil, such as Erichthonius. Athena's name is pre-Hellenic, and the myth where she won the city from Poseidon, a later god, is most likely symbolic of these ancient peoples clashing with the new arrivals to the city. One of the oldest cities, Corinth dates back to prehistoric times. The names itself means "wealthy" and was considered one of the greatest commercial cities of the Mediterranean. Though conquered by the Romans in 146 BCE, Julius Caesar established a new settlement in 44 CE until an earthquake destroyed the city 500 years later. All the ruins which remain, except for the columns at the Temple of Apollo, are Roman. The hub of the booming civilization known as Minoan, named for the infamous King Minos. [All kings of that period were called Minos, which actually may have been a title rather than a name.] The island itself and its capitol, Knossos, was a maritime powerhouse in the Greek world between 1400-1100 BCE. The Greeks invaded the city somewhere between 1200-1100 BCE, and the myth of Theseus may be an allegory for the triumph of the Achaeans over the Cretans. Delphi was often viewed as the center of the world. Orginally a shrine for Gaia [Mother Earth], the introduction of the paternal society replaced the maternal figure. Myth claims a younger [and male] god, Apollo, slew the Python that guarded the shrine and claimed the sanctuary for himself. The priestess, or oracle, of Apollo was sought after by all major Hellenic cities for her power of prophesy [in other words, she was trashed beyond belief from chewing laurel leaves and babbling all types of nonsense that the Greeks regarded as "psychic".] Thanks to the French, Delphi today is well preserved. Greece's highest mountain [approximately 9600 feet high] and home to all the major deities. The city of Zeus; eventually, the Greeks instigated a festival of athletic competions every four years there in his honor, which became known as the "Olympics". The artificer Pheidas constructed an awesome temple of Zeus that was completed in 430 BCE and made out of ivory and gold. The kingdom of Menelaus and known as a completely military state. The term spartan actually is rooted from this powerful city and means having the traits of this city's residents: brave, frugal, resourceful, and disciplined. Founded by the Greek hero Cadmus after Zeus had carried off his sister Europa as a white bull. On his search, he stopped at Delphi and was told to follow the tracks of a cow. As he traveled eastward from Delphi, he and his entourage encountered a heifer that they followed. It stopped in Boetia and rested on a plain. At a spring of water, all of Cadmus's men were killed by a fierce dragon; Cadmus managed to slay the beast but was dumbstruck on how to start anew and build a city without men. The gods advised him to sow the dragon's teeth in the soil, which he did. Armed men immediately sprang from the earth, Spartoi [sown men]. Cadmus threw a rock among them and they began fighting each other. The five survivors assisted Cadmus in building the city. Thebes is often the center of many of the ancient playwrites' and poets' works [perhaps the most prominent being Aeschylus's Seven Against Thebes]. Commonly viewed as a "savage" region, the Thracians are the home of what the Greeks considered "different" peoples. The god of war, Ares, is often regarded as "Thracian" because of this. The "legendary" city of King Priam, Queen Hecuba, and the valiant Hector. In myth, the city was founded by a son of Zeus, Dardanus, and the city itself was named after his grandson Tros. Tros's son Ilus gave us the term Ilium—hence the Iliad— and Priam was from that lineage. Many had believed Troy to be mythical, but the great German scholar Heinrich Schliemann excavated the city in 1870 CE. The city was quite small, and there were appoximately nine other cities discovered on the same site, Troy being the sixth one up. Other scholars, thanks to what Schliemann had uncovered, estimated the sack of Troy by the Greeks occurring somewhere around 1240 BCE. Copyright © thehellenictimes. All Rights Reserved.